The week of February 28th to March 6th, 1999 was observed as children's week. Activities were organized throughout the country to honor our Belizean youngsters. The students of San Pedro R.C. School were involved in a series of activities throughout the week. On Tuesday, March 2nd, the teachers organized the San Pedro version of a penny party, the "dollar party." Items were available for sale at no more than a dollar. The profits were used by the individual teachers to purchase a token for their students. On Wednesday, March 3rd, students, teachers and a large amount of parents planted various trees in the school compound as part of their beautification program. This was followed by all-day sporting activities on Thursday at the old football field. The students accompanied by their teachers and some parents participated in a series of games such as lime and spoon, sack race, needle and thread, three-legged race, balloon toss, relay race, slow bicycle race and tug-o-war, volleyball and football. To culminate the week of activities, the children attended mass on Friday, March 5th. After mass, the Mayor of San Pedro Town, Alberto Nuñez addressed the children. 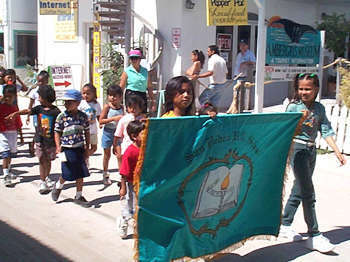 After the ceremony the children took part in a school parade through the main streets of San Pedro Town ending at the school grounds. The colorful parade even included a group of energetic cheerleaders. After the parade the children were invited to an assortment of treats. 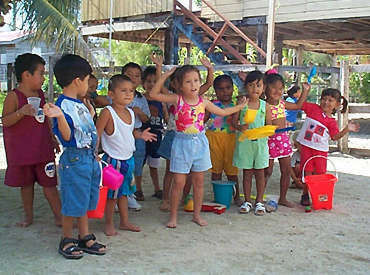 The San Pedro Pre-school opted to stay at their school's compound to spend a full day of games and good fun. Teachers and parents arranged a wide variety of goodies for the children, including the popular piñata. The ABC Pre-school picnicked at the Mosquito Coast Lions Park and then moved to the Royal Palm Inn to spend the rest of the day "chilling" in the pool. Little Angel's Kindergarten had an all day picnic at Mar De Tumbo. The children and parents together enjoyed fun activities and swimming. Lydia's Institute of Fine Education traveled to the northern part of Ambergris Caye where they spent the morning at the Essene Way and then had the rest of the afternoon as a holiday.